A reliable source for Mezzanine Systems information and a resource for accessing leading Mezzanine Systems and suppliers. Mezzanine systems are raised, open platforms supported by beams and columns that are used to create extra space for many applications. Industrial mezzanines are used in warehouses, factories and other industrial settings for the creation of storage and work space and for other purposes. Constructing a mezzanine system in a warehouse effectively doubles the capacity of the area where the mezzanine is built. Some systems can be built to accommodate light machinery and office space, and others are used for temporary or long-term storage of supplies or equipment. Mezzanines can be built in square, rectangular and irregularly-shaped configurations. They can be placed in the middle of a warehouse floor, above existing shelving (assuming the shelving can support the extra weight), around a factory’s perimeter and in many other places. Mezzanine Systems Mezzanine systems are raised, open platforms supported by beams and columns that are used to create extra space for many applications. Industrial mezzanines are used in warehouses, factories and other industrial settings for the creation of storage and work space and for other purposes. 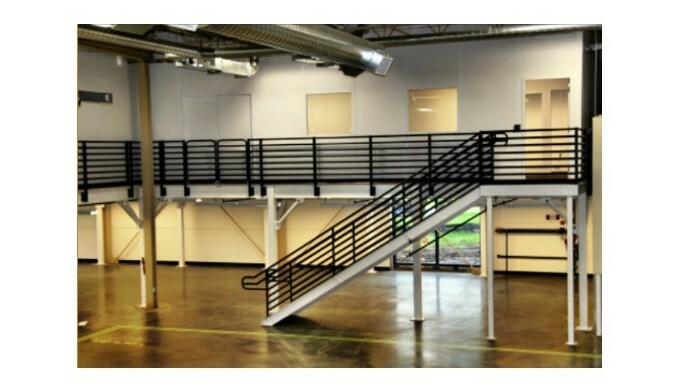 Mezzanine systems can be custom-made or prefabricated. In factories and warehouses that have been in operation for many years, machinery and components may be installed throughout the workspace, making it difficult to place prefabricated mezzanines. In these cases, custom-made mezzanine construction companies may need to come on-site and develop a creative solution that will effectively provide new space without disrupting existing operations. In situations when enough free space can be easily cleared to allow for mezzanine construction, prefabricated mezzanines are often a simple, effective means by which extra space can be added to an area. They can be bolted together over and around existing storage and work areas and integrate other equipment like electrical conduits by running them through web bar joists. In addition to warehouse and factory settings, mezzanines can also be designed for wineries, archives, automotive dealerships, distribution centers, and food processing plants. Mezzanine systems can also transform vertical warehouse space into office space, complete with lights, outlets, doors, and windows.